Hundreds of Chukchi Sea polar bears spend the ice-free months on Wrangel Island, including this adult female and cub photographed in fall 2017. “This work represents a decade of research that gives us a first estimate of the abundance and status of the Chukchi Sea subpopulation,” said first author Eric Regehr, a researcher with the UW’s Polar Science Center who started the project as a biologist in Alaska with the U.S. Fish and Wildlife Service. “Despite having about one month less time on preferred sea ice habitats to hunt compared with 25 years ago, we found that the Chukchi Sea subpopulation was doing well from 2008 to 2016. Of the world’s 19 subpopulations of polar bears, the U.S. shares two with neighboring countries. The other U.S. subpopulation — the southern Beaufort Sea polar bears, whose territory overlaps with Canada — is showing signs of stress. “The southern Beaufort Sea subpopulation is well-studied, and a growing body of evidence suggests it’s doing poorly due to sea-ice loss,” Regehr said. The striped area on the left shows the Chukchi Sea polar bear subpopulation’s range. Sea ice reaches south to the dotted line in winter, and retreats to the solid black line in summer. The right shows a closeup of the study area off Alaska’s coast. White circles show where polar bears were tagged between 2008 and 2016. Polar bears were listed as threatened under the U.S. Endangered Species Act in 2008 due to the threat of declining sea ice, which the animals depend on for hunting, breeding and traveling. But the new study suggests that such effects are not yet visible for bears in the remote waters that separate Alaska from Chukotka, Russia. “It’s a very rich area. Most of the Chukchi Sea is shallow, with nutrient-rich waters coming up from the Pacific. This translates into high biological productivity and, importantly for the polar bears, a lot of seals,” Regehr said. Previous studies by the State of Alaska show that ringed and bearded seals have maintained good nutritional condition and reproduction in the Chukchi Sea region, Regehr said. The area also has an abundance of whale traffic, and when carcasses wash up on shore the polar bears can feed on them in summer, when the sea ice melts and a portion of the Chukchi Sea subpopulation waits on land for the ocean to refreeze. Recent ecological observations had suggested that Chukchi Sea bears are doing well. A study led by co-author Karyn Rode, at the U.S. Geological Survey, showed the top predators have similar amounts of body fat as 25 years ago, a good indicator of their overall health. The current study is the first assessment of the subpopulation size using modern methods. It estimates just under 3,000 animals, with generally good reproductive rates and cub survival. As a federal wildlife biologist based in Alaska until 2017, Regehr and colleagues gathered the data by tagging roughly 60 polar bears in most years from 2008 to 2016. He flew by helicopter over the area just north of Alaska’s Seward Peninsula, looking for tracks on the sea ice. The helicopter then would follow tracks in the snow to locate the bear and use a tranquilizer dart to sedate the animal. Over about an hour, researchers would weigh the bear, collect biological samples, apply individual tags and, in some cases, attach a GPS transmitter. All the data were incorporated into a new model designed to estimate population size for large carnivores that are highly mobile and whose territory spans a large region. The authors made the model publicly available in the hope that it will be used on other populations or species. “Polar bears can travel thousands of miles in a year. But with the GPS tags, we can see when a bear leaves our study area but is still alive, because it’s moving. This information is key because there are bears that we see once and never see again, and to get a good population estimate you need to know if these animals died or just moved to a new area,” Regehr said. For the first time, the model also considered local and traditional ecological knowledge collected by the North Slope Borough of Alaska from Native hunters and community members who have generations of experience with polar bears. 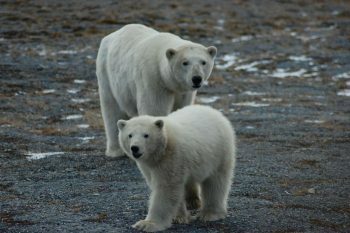 “It was important to bring our science together with the observations and expertise of people who live in polar bear country year-round and understand the animals in different ways,” Regehr said. 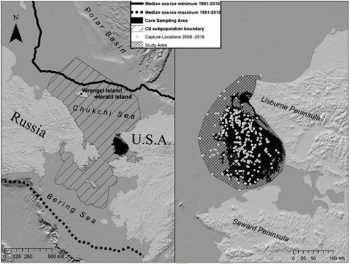 A joint U.S.-Russia commission is responsible for management and conservation of the Chukchi Sea subpopulation. In response to the new assessment, the commission raised the sustainable level of subsistence harvest, which is nutritionally and culturally important to Native people in Alaska and Chukotka. 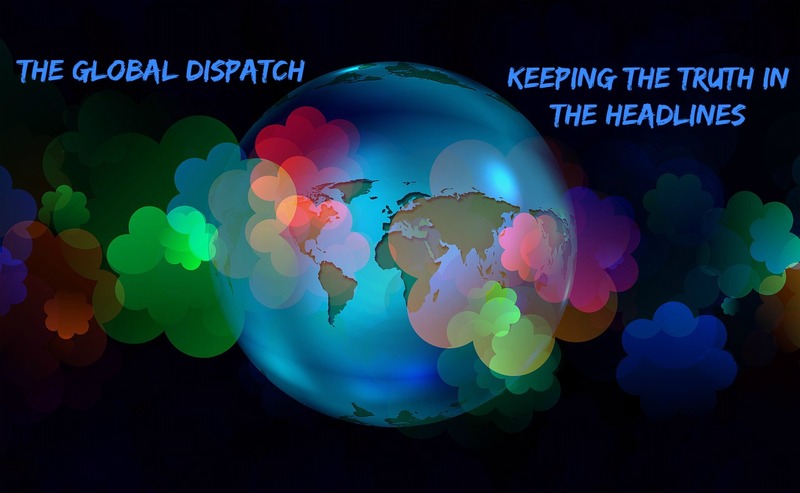 “These polar bears move back and forth between the U.S. and Russia, so it’s very much a shared resource,” said Regehr, a longtime scientific advisor to that commission. As part of his current research at the UW, Regehr spends about two months each year working with Russian scientists on Wrangel Island in the Arctic Ocean, where hundreds of Chukchi Sea polar bears spend their summers.